Two victims of a major accident between two passenger buses on the island main road, in the New Guinea area, on Wednesday January 23, remain hospitalized and are in critical condition, the Police have revealed. 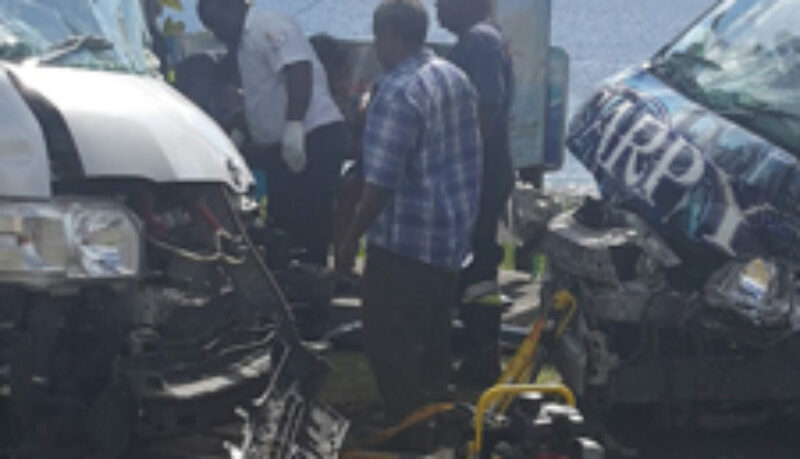 Initially, six persons were taken to the Joseph N France General Hospital, as a result of the crash, but four were released after medical evaluations. Desmond Connor of St. Paul’s” were involved in the collision. “Circumstances are that HA374 was travelling from Basseterre to St. Paul’s and collided with the front of H8821,” the report added. According to witnesses, the bus referred to as “Carpy” was coming from the Sandy Point area. Acting Fire and Rescue Chief Everette O’Garro confirmed that some of his personnel had to utilize the “jaws of life” to extricate two persons- one from each bus. Video footage of the Fire and Rescue services working to extricate the trapped persons from the wreck is being circulated via social media and Whatsapp and there has been much concern for the two victims who had to be freed. The Police have indicated that investigations are continuing into the matter. This accident comes within weeks of another serious collision involving two passenger buses in the White Gate area, where one bus driver was pitched yards out of his vehicle, after the impact of the accident.